We’ve just wrapped up the first week of 30 Days of Biking. I’m not blogging every day, so here’s a wrap-up of week one. 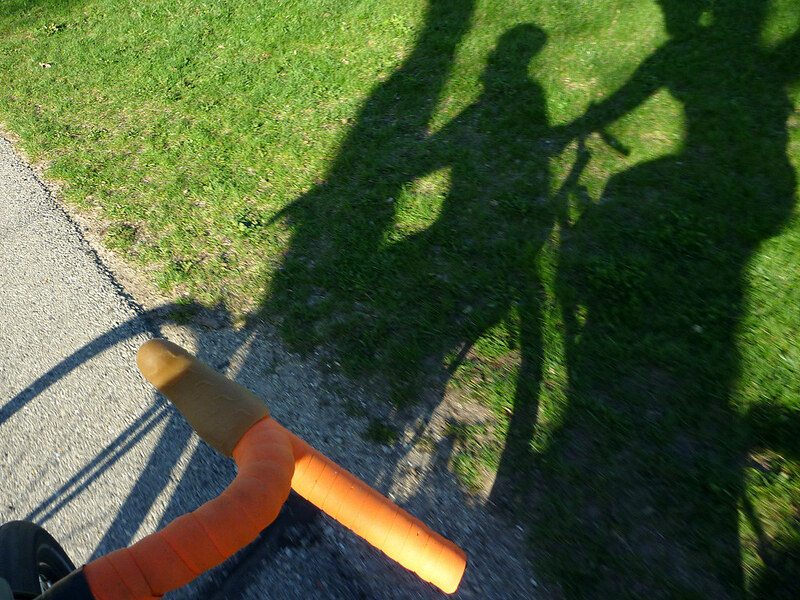 On April 1, I took the newly re-framed Soma Smoothie out for it’s inaugural long ride. It was good. I rode to and from work every day (including a bit in company with ML), and did some wrenching on the Albatross, the One-Way, and the Trek 613. On April 6, we took advantage of the full moon to make a nighttime run down the Badger State Trail. Monday: crew fours on the lake, woman meditating on the end of the pier, ticking bottom bracket. Tuesday: sights and sounds: shoaling cyclists, sun shining on the lake, the sweet sound of a silent bottom bracket. Thursday: camo-wearing photographer shooting loons, knee-high socks on fit legs, a train rumbling in the distance. Friday: sights and sounds: hoarfrost, sun-glare, and conversation with @Bumbleberger. Saturday: the first woodpecker, gardeners in the community, and the weeping of my fried quadriceps.